I am looking for a camera that can capture such an image. I am not looking for more fps. less fps is fine, but it must be able to capture such an instance. What features should I look in such a camera? How fast should be the shutter speed? What other things I should look for? As Michael said, shutter speed is largely irrelevant – flash duration and timing relative to bullet passage is what counts. Shutter speed can be as SLOW as is helpful – maybe even "bulb". 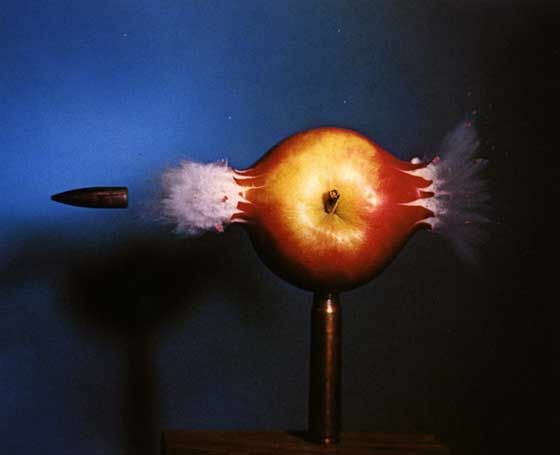 Bullet speed should be arranged to be as slow as possible without adversely affecting the affect on the target. Bullet needs to not move appreciably during exposure. So, how long (or short) does the exposure need to be? Say bullet was travelling at 100 feet per second. and has moved a maximum of 5% of its length – maybe less. At 1000 fps that would be 4 μS. 1 μS would be even better. Will a Xenon flash tube do this? Discharge durations for common flashtubes range from 1 microsecond to tens of milliseconds, and can have repetition rates of hundreds of hertz. Flash duration can be carefully controlled with the use of an inductor. See reference to PerkinElmer catalogue below. Will an LED Based "flash" do this? Achieving this sort of result with LED lighting would require significant power levels. 106/200 = 5,000 Watt of LED illumination (!!!). In practice this is only required for 10 μS so actual power is a fraction of a Watt BUT the LEDs MUST be able to produce the peak power level required and modern white LEDs have a peak: continuous ratio of typically less than 2:1. So – "not really", so far. Whereas, a suitably designed Xenon flashtube can be capable of producing these very high levels of power for extremely short periods. 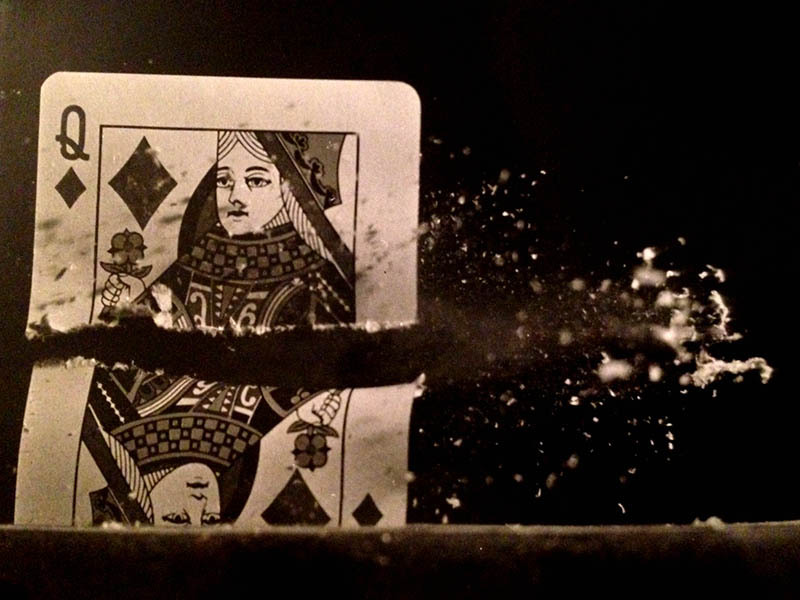 As Paul said, the photo was produced by the late Harold Edgerton and is one of the ones he is most known for. You need to study his website re methods and equipment. Alas, the flash duration that I calculated above by rule of thumb was just about right and my "nice" value was spot on one millionth of a second. Have a look at the PerkinElmer catalog for what you'll need. 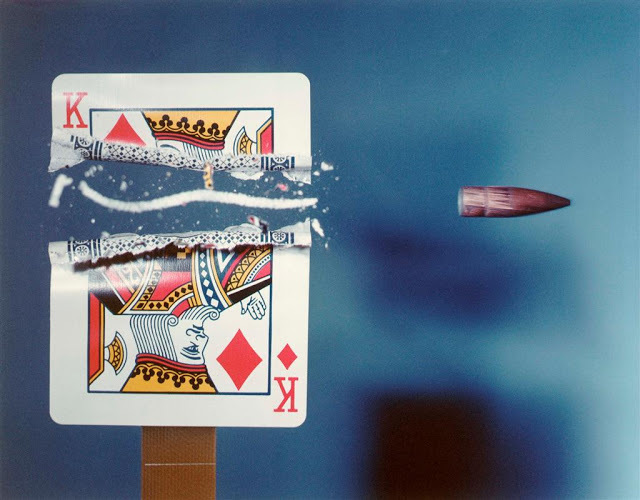 This famous photo of Harold Edgerton's is specifically identified as having a 1/1,000,000th second exposure time. E&OE - it's late and there is still work to be done. I may very well have dropped or added a power of 10 or few above or done something really silly - by all means do point out any errors. The camera doesn't matter. In high speed photography such as this photo it is all about the speed of the flash and being able to fire it at precisely the correct moment. The flash is usually fired with an electronic trigger that reacts, after a specific delay of several milliseconds, to the noise of the gun firing . The camera's shutter can remain open for several seconds before and after the exposure because other than the flash the room is totally dark. I took shots like this in Doc Edgerton's lab in the 80's. The setup was simple. From experience we would guess roughly where to place the microphone between the rifle and the target. Can do quick calculations to get an estimate. Turn off the lights. Stand back! Fire a practice shot and observe where the bullet is. The very short duration of the strobe makes the bullet stand out quite clearly. Repeat test shots to fine tune the location of the bullet, which was very repeatable and consistent. Final shot: Place object on the support. Turn off the lights. Set camera to bulb mode. Fire. The bullet was traveling at 2,800 feet/second. Not the answer you're looking for? Browse other questions tagged high-speed or ask your own question. How to take photo of water splash without photo getting dark? Does a long exposure in DSLR camera have a similar effect to a global shutter? What camera has the highest number of frames per second?